Alex is a specialist employment solicitor, who advises clients in the Liverpool region. She can advise you on all aspects of settlement agreements and offer you strategic advice on your options. Alex helps her clients achieve positive outcomes, whether that’s talking you through the terms and enabling you a quick simple sign-off, where the deal is reasonable and you’re happy to sign, or negotiating better financial terms or changes to the settlement agreement wording. 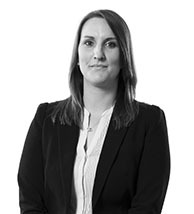 While she has a particular expertise in settlement agreements, Alex advises on all areas of employment law, including: redundancy, unfair dismissal, maternity rights, constructive dismissal, restrictive covenants, contracts of employment, discrimination and whistleblowing. IMPORTANT: The contents of this page are for general guidance only and should not therefore be regarded as constituting legal or other advice or recommendations. You are free to instruct any employment solicitor you wish. Previous articleNeed help with a Settlement Agreement?